We think it is safe to say that Duluthians and the Twin Ports in its entirety welcomed Dunkin' Donuts to the area with open arms and empty stomachs. 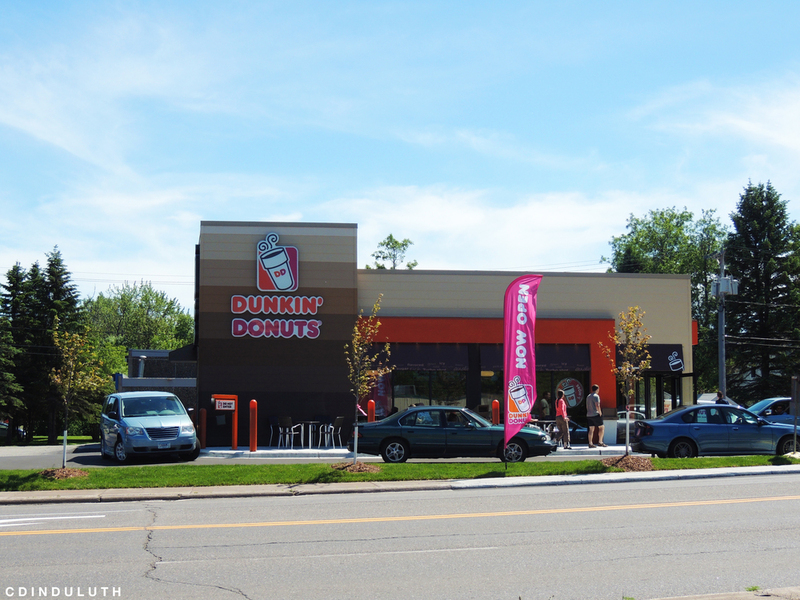 Dunkin' Donuts opened their first Northland location (and second in the state) last week at 104 West Central Entrance in Duluth. Now we don't blame you if you have yet to have gotten a chance to try them out. The lines were pretty long for the first few days and the parking lot seemed to have an endless ring of cars waiting for the drive thru. But hey! It just shows how excited people area. And yes, we waited in the lines so that we could bring you a few photos of the new building. The new store was built at the site of the former Warehouse Liquors store. The liquor store had been in business for about 25 years before a franchisee for Dunkin' Donuts purchased the building and ultimately razed it. We say ultimately because the foundation of the original building was still used for the new Dunkin' Donuts store. Everything else however is brand new. It's hard to miss Dunkin' Donuts when driving up Central Entrance. Sitting on a prominent corner the building features a bold and modern design. Flat roof lines and neutral colors grace the exterior with pops of the company's signature orange color drawing customers eyes towards the new business. We think that the redevelopment of this prime corner has really done a lot for the overall feel of the area. Hopefully it will help kick start the redevelopment of Central Entrance that the city of Duluth has been planning for a decade now. That plan includes the redevelopment of most of the residential corridor going up Central Entrance after Dunkin' Donuts into a commercial district. The eventual goal is to connect the two retail districts, Central Entrance and the Miller Hill area. Technically even before Dunkin' Donuts opened their Central Entrance location last week work had already begun on another Dunkin' Donuts in the Twin Ports. Dunkin' Donuts will open a new store in the former Mr. Movies space on Tower Avenue in Superior. If you've driven past the site recently you might have noticed that construction is in full swing. An exterior wall of the building had to be removed and rebuilt so that a drive through window could be included. The new store will be very similar to the Duluth one in size and looks. If construction goes according to plan Dunkin' Donuts in Superior will open this September. But wait, there will be more. Dunkin' Donuts continues to scout for additional sites in the Twin Ports and up on the Iron Range. Eventually there will be about five more store locations with the potential for even more. East Duluth is a very likely candidate for the next Duluth Dunkin' Donuts location. As always, check back to CDINDULUTH for more exciting news regarding this development and others within the Twin Ports.